WE ARE LOCATED AT 3801 CANAL STREET. We are now located at 3801 Canal Street, #304. The first floor of the building has a healthcare clinic on the first floor. We are on the third floor. It is ok to park in the spaces on the side of the building that say "reserved for Primary Care Consultants". They are reserved for the entire building. Please enter the building at the N. Cortez Street entrance. Enter the code #2000 into the call box, and when it buzzes, press the elevator button. You MUST enter the '#' sign. When you exit on the 3rd floor, take a right. We're three doors down on the right side. Our Maple Street location is closed. Welcome to the Moldaner's Digital Imaging and Archiving website! We're glad you're here. Please take the time to check out our many products and services. We hope you find our site informative. Please help support local businesses. Although we no longer sell digital cameras like we did pre-Katrina, we do still have supplies and accessories for many old film cameras. Also, check out our special services, like our archival scanning and digital wide-format printing services. We are also the ONLY dealer in the South Louisiana/Mississippi area that still stocks traditional black and white darkroom paper and supplies ! In recent years, we have begun specializing in the printing of numerous photographic art exhibits. We will soon be adding a gallery section of some of our projects, to give you a better idea of just what we have to offer in digital printing services. We also participated for the first time as a venue during PhotoNola, in December of 2015, hosting an exhibit by Ray Laskowitz titled "Krewes, Clubs, Indians and Brass", which depicted the culture in the streets of New Orleans such as second lines and Mardi Gras Indians. You can see some of Mr. Laskowitz' work on his Storyteller blog. In previous years, we have printed exhibits that have hung in The New Orleans Museum of Art (" Ancestors and Descendants " - George H. Pepper exhibit), The Collins C. Diboll Gallery ( " In the Blink of an Eye " - Harold Baquet exhibit) at Loyola University's Monroe Library, and The Latin American Library gallery ("Encounters with Antiquity" - Roxanne Davila exhibit) at Tulane University's Tilton Library. We also completed an exhibit that was part of the citywide "¡Sí Cuba! " exhibit in January of 2010. In addition, we have been involved in ongoing scanning/archiving and restoration projects for the Middle American Research Institute, the Tulane Law School, and the Tulane School of Architecture. Some of these include archiving and reproducing images from glass Lantern Slides, nitrate negatives and 200-year old books. 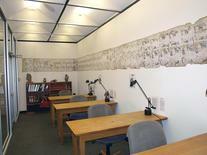 Most recently, we have completed a 30,000 slide archiving project for a history professor/archaelogist at Tulane University. I am saddened to announce the passing of my father, Edward H. Moldaner, Jr. on June 22, 2014. He was 81. 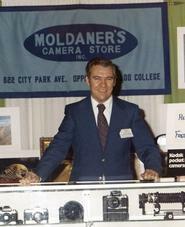 He founded Moldaners Photo Service Inc in 1965, which eventually became Moldaner's Camera Store, Inc. He has been our inspiration all these years, and he will be missed. Due to his passing, and our imminent relocation to Mid-City, we will NOT be reopening the Maple Street location after June 23rd. Customers that may have finished work will be contacted directly so arrangements can be made to pick it up. If you have something you need to pick up, leave a message on our answering machine, (even though the machine says not to), and I will try and return your call when I can. Please understand I may not get to it immediately, but will do my best. Moldaner's Digital Imaging and Archiving is now located at 3801 Canal St, #304, across from Mandina's Restaurant. "...Moldaner's attention to detail and sound work ethic were the components essential to preserving and vastly improving these priceless archives." Any length up to 2 hours! CitySlick local ads and coupons. Find Audio and Electronics Deals Deals!